Picture this: you’re attending a lecture from a highly respected professional in your field. The lecture was well publicized and draws a large regional or national audience. When this person takes the stage to speak, however, you can hardly understand a word they say. Your peers are jotting down notes and nodding their heads in agreement, but you feel completely lost. When the lecture ends, the other attendees all begin discussing the topics amongst themselves, but once again you are left out of the conversation. 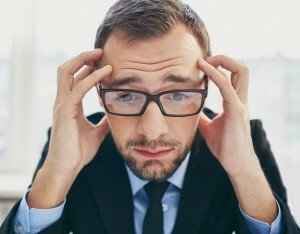 This frustrating experience might be all to familiar for conference attendees who are deaf. Organizing a conference takes a great deal of preparation, but one thing that frequently gets overlooked is the quality of sign language interpreters. After investing months of energy into creating a successful event, it only makes sense to provide equal access for all individuals. When experts take the stage to address the audience, their precise message should be clear to everyone in attendance. When attendees are debating hot industry topics and building their networks, people who are deaf deserve reliable access to the conversations around them. Providing qualified Platform Interpreters, also known as Conference Interpreters, helps ensure that people who are deaf can access and participate equally in organized events such as lectures, seminars, workshops, trainings, and professional development events. The services of these interpreters will be utilized during formal presentations, breakout sessions, and all social opportunities throughout the conference. High quality Platform Interpreters possess a skill set which enables them to accurately communicate the important and often specific information being presented in real-time. People around the world watched on television as the interpreter at Nelson Mandela’s funeral signed nonsense to deaf South Africans. It was a very public example of an unfortunate problem. This type of service is unacceptable, and it is the responsibility of event organizers to make sure that deaf attendees get the quality of communication access that they deserve. Basic fluency in the spoken and signed languages is a good start but, above and beyond that, qualified Conference Interpreters will be certified professionals with strong language skills and experience. They will also understand any topical vocabulary and common industry phrases. Since most conference interpreting happens simultaneously, meaning the interpreter is providing interpretation at the same time the message is being delivered, they must have a firm grasp of the overall message so they can follow along with the speakers. Simultaneous interpreting can be a real challenge without sufficient preparation. 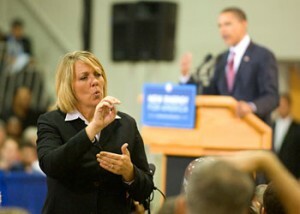 To accurately represent both event speakers and deaf consumers, qualified Conference Interpreters will do their homework. They will research the mission of the organization and the intention of the event. They will learn the names of the presenters and a little bit about their background. A great Platform Interpreter will request conference documents, multimedia, and speakers notes in advance. They know the speaker’s motives and are able to faithfully deliver their message. A high quality Conference Interpreter learns how the event will be set up and how the schedule is expected to flow before the interpreting assignment begins. 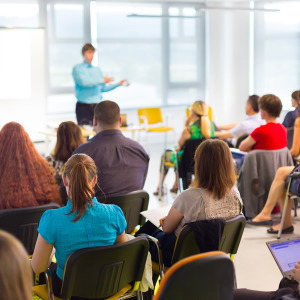 They know the best place to sit or stand during each portion of the conference and will educate the organizers to be sure they are placed in such a way that deaf attendees have full access to the speaker, presentation, or group. Qualified Conference Interpreters should be flexible, yet organized to meet the needs of deaf consumers. They are confident in their preparation, yet able to roll with the changes that are often inevitable in a large coordinated event. Depending on the length of the event, the type of event, and the number of deaf attendees present, interpreters will be working in a team of at least two, possibly more ASL interpreters. Supporting the team is one of the most important roles of a Conference Interpreter. Interpreters must communicate their needs while meeting the expectations of other interpreters and deaf consumers. The interpreting team should be well-coordinated and always working together to ensure accurate and clear communication access. Qualified Conference interpreters keep one another informed and on point. They will also advocate for the use of CDIs whenever appropriate. Qualified Conference Interpreters will ensure they have adequate working conditions. This includes contacting the event organizer and letting them know the technical requirements or providing service. Interpreters should also be ready to educate hearing entities about the basic function of an ASL interpreter and how to work with one. 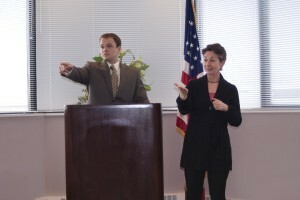 In some instances, interpreters must advocate to be on stage, on camera, or near a presenter. A good Platform Interpreter knows his or her limits and will not take on an assignment outside the scope of their skill set. Additionally, they will not accept an assignment where they feel a personal bias or ethical conflict might prevent them from effectively facilitating communication. LC Interpreting Service is pleased to offer qualified Conference Interpreters in New York City for a wide variety or entertainment or professional events. We make the process for securing interpreters and providing equal access as simple as possible. LCIS offers quality services for deaf consumers with a strong emphasis on client satisfaction.